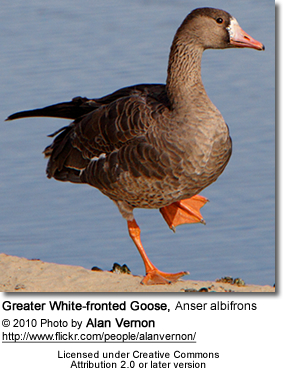 The genus Anser includes all grey geese and some include the white geese in this genus as well. 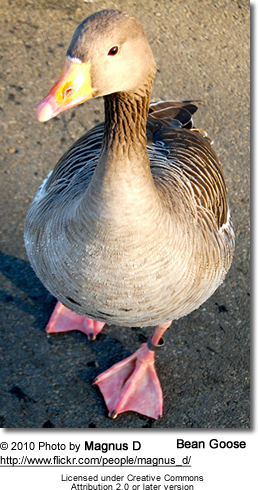 The largest subspecies is the Greylag Goose - with a weight range of 5.5 - 9 lbs (2.5 - 4.1 kg). The smallest subspecies is the Ross's Goose (which is by some placed into the genus "Chen") -- weighs about 2.6 - 3.5 lbs (1.2 - 1.6 kg). All members of this genus have pink or orange legs and feet; and bills that are either pink, orange or black. All have white under- and upper-tail coverts (feathers), and several members have some extent of white on their heads. The plumage is otherwise either grey or white, with black or blackish primary - and sometimes secondary - flight feathers. The related genus Branta or "black geese" have generally a darker plumage and black legs. 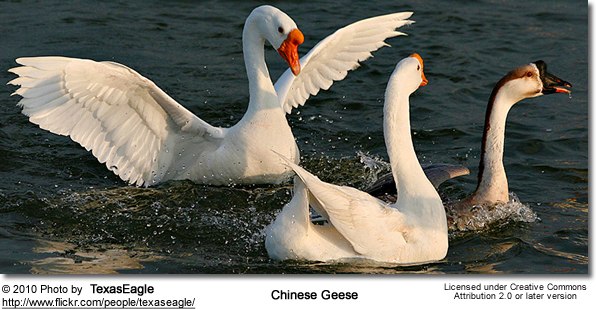 The white geese are sometimes separated as the genus Chen, with one of them being potentially split off in the genus Philacte. 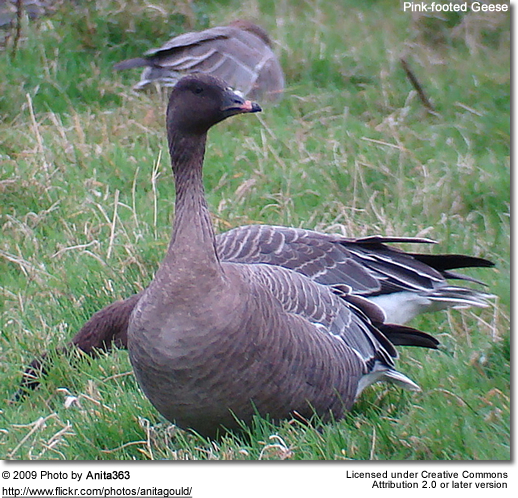 Anser - Generally referred to as "grey geese". This is somewhat misleading, as this group also includes white and brown geese. All have pink, orange or yellow bills and legs. Western Greylag Geese - Anser anser - Breed in Iceland, Scandinavia and Finland. Winter in the British Isles. Bean Geese - Anser fabilis - Breed in northern Norway, northern Sweden and northern Finland. Winter in the British Isles, southern Scandinavia, Germany, the Netherlands south to the Mediterranean Sea. Pink-footed Geese- Anser brachyrhyncus - Breed in Spitsbergen, Greenland and Iceland. Winter in Scotland, England, Germany, the Netherlands and Belgium. Greater White-fronted Geese - Anser albifrons albifrons - Breed in the far north of Europe and Asia, and winters further south and west in Europe. Pacific Greater White-fronted Geese - Anser albifrons frontalis - Occur in the far east of Siberia east to Arctic Canada. Winter in United States and Japan. Tule Greater White-fronted Geese - Anser albifrons elgasi - Breed in southwest Alaska. Winter in California, USA. Lesser White-fronted Geese - Anser erythropus - Breed in northernmost Asia, rarely breed in Europe. Winter further south in Europe and occasionally Great Britain. Bar-headed Geese - Anser indicus - sometimes separated in Eulabeia. Native to Central Asia. Swan Goose - Anser cygnoides - - sometimes separated in Chen. Breed in inland Mongolia, northernmost China, and southeastern Russia. Winter in central and eastern China. May visit Japan, Korea, Kazakhstan, Laos, coastal Siberia, Taiwan, Thailand and Uzbekistan. Ross's Geese - Anser rossi - - sometimes separated in Chen. Breed south of Queen Maud Gulf and west of Hudson Bay. Winter in California, Texas and Louisiana, United States. 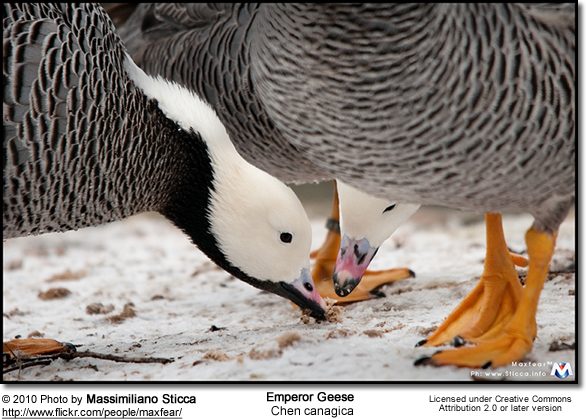 Emperor Geese - Anser canagicus - sometimes separated in Chen or Philacte. Breed around the Bering Sea, mostly in Alaska, USA, but also in Kamchatka, Russia. Winter mostly in the Aleutian Islands located in the Northern Pacific Ocean westward from the Alaska Peninsula. Geese consume a wide variety of plant material, including grass, roots, shoots, leaves, stems, seedheads and fruits of other herbaceous marsh vegetation, aquatic plants, and agricultural grain and potatoes (particularly in the winter).